Late of Murwillumbah. Formerly of Uki. Passed away peacefully after a short illness on Thursday 11th October 2018. Aged 99 years & 8 months. Dearly loved Wife of Noel Robinson (dec’d). Loved Mother and Mother-in-law of Bruce & Carol McClure, Diane & Barry Harding, Trish & Simon Clough. 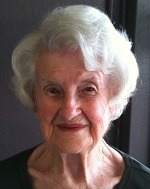 Cherished Grandmother of Greg, Jenny, Teresa, Joanne, Darryl, Karen and Elly. Loving Great-grandmother of Eleven & a Half. Loving Great-Great grandmother of one. Elder Sister of Cyril (dec'd), Thelma (dec'd), Estelle (dec'd), Audrey (dec'd) and Ron (dec'd). Family and Friends are warmly invited to attend Jean’s Funeral Service to be held at the Tweed Heads Memorial Gardens, Kirkwood Road, South Tweed Heads,on Friday 19th October 2018, at 2.30 pm (NSW).